Lesson learned from Aki Matsuri 2012: Eat first; drink later. 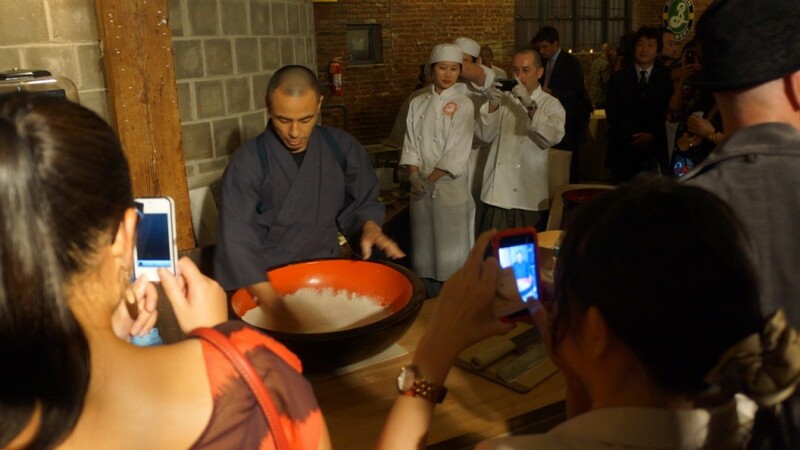 JapanCulture•NYC loves to eat, so attending The Gohan Society’s annual fundraiser was a no-brainer. But JapanCulture•NYC also loves to drink, so I missed out on a lot of the offerings from the eleven participating restaurants because they ran out of food while I tasted sake. And whisky. And beer. 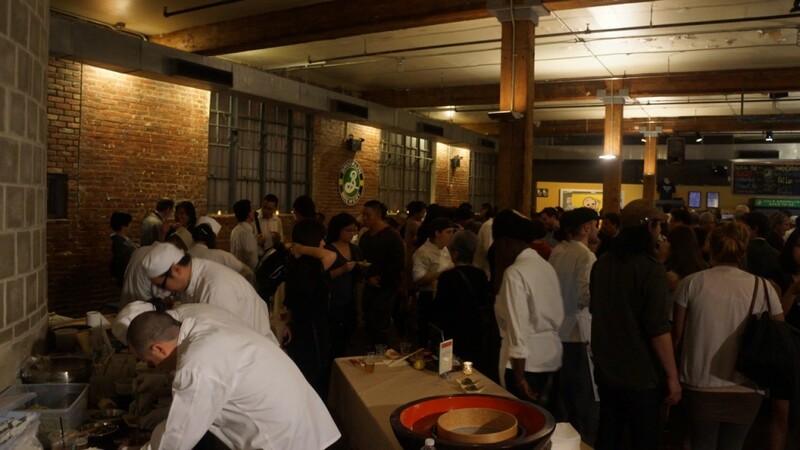 Each year The Gohan Society, a non-profit that promotes Japanese culture through its cuisine, holds a big food and drink fest to raise money for its outreach programs that include chef exchanges and cooking classes. 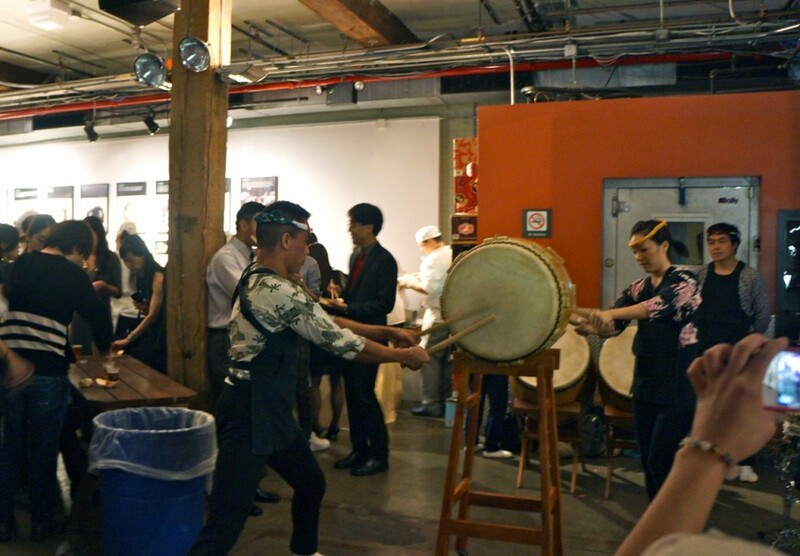 For the second year in a row, Aki Matsuri was held at Brooklyn Brewery, where eleven restaurants, three sake companies, and Suntory Whisky provided tastings. From ASPEC, a consortium of sake brewers in Akita Prefecture, I tried the Dewatsuru Habataki Junmai Ginjo, a clear and crisp sake with a beautifully clean finish, and the Hideyoshi Honjozo, which is earthy and full-bodied. 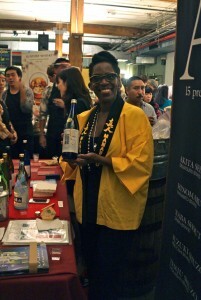 “Everyone brought Junmai and Junmai Ginjo, so I was happy to have this Honjozo to serve,” says Linda Noel Kawabata, Advanced Sake Specialist and USA Brand Manager of ASPEC. Then it was on to Kuramoto and their Outouka, a mild and flowery sake, and Yuzu Omoi, a pleasantly aromatic sake made with the Japanese citrus. 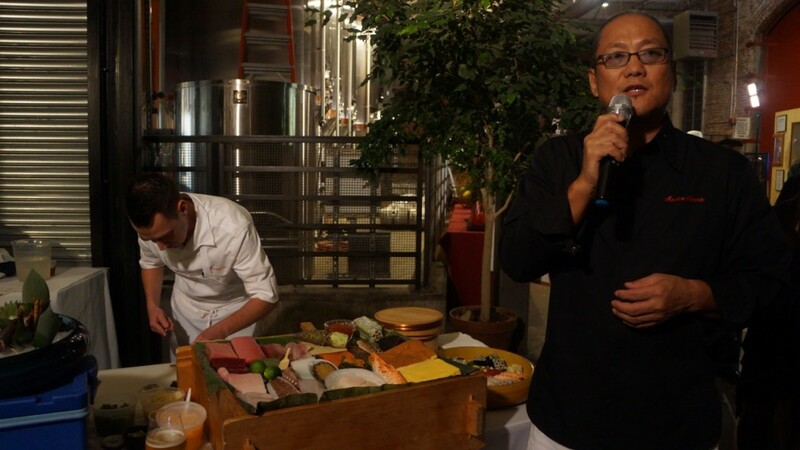 “It’s important to come here [to Aki Matsuri 2012] to introduce our sake to everyone,” says Kuramoto’s Taku Michishita. I ended my sake tasting tour with both offerings from TY KU, Silver (Premium Junmai) and Black (Super Premium Junmai Ginjo). I had a taste of Suntory Whisky‘s 12-year-old single malt Yamazaki as well as a special whisky cocktail that had a sprinkle of nutmeg on top. Wow. Strong. 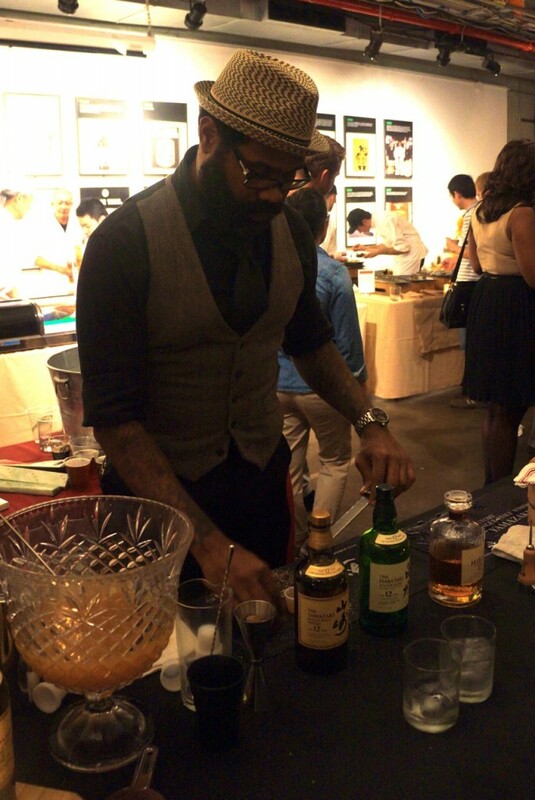 Yamazaki Brand Manager Gardner Dunn’s ability to carve perfect spheres from blocks of ice was a crowd pleaser as well. 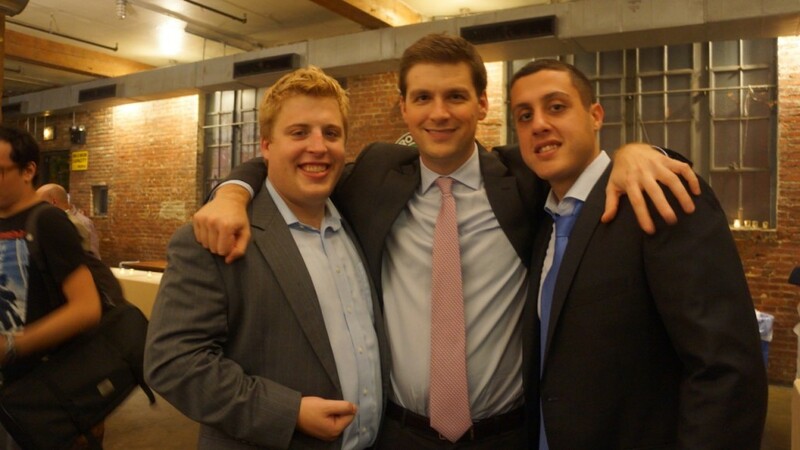 Since the event was held at Brooklyn Brewery, of course I had to have a beer. I chose Sorachi Ace, a craft beer made with a special hop developed in Japan and grown in America. 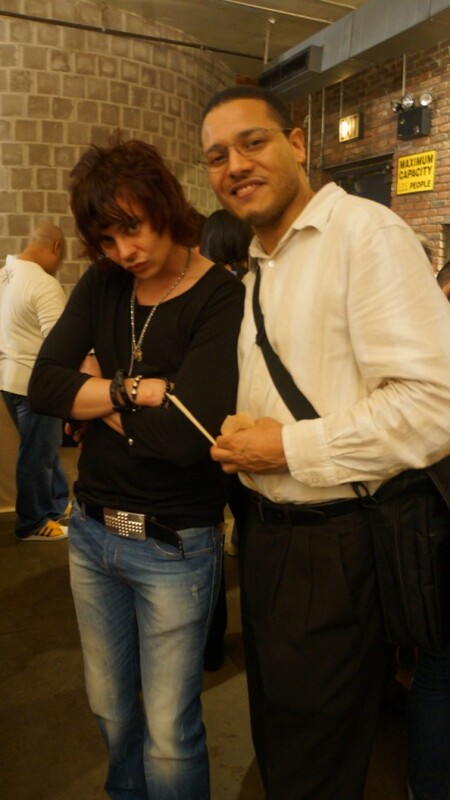 But let’s get to the food, which is the whole point of Aki Matsuri 2012 and The Gohan Society. Since I didn’t eat much (four out of the eleven restaurants, not a good ratio), I relied on other guests to give me the scoop. I heard Sakagura’s tuna dish was lovely, and Talde’s perilla leaf with tamarind bacon was a huge hit. So huge that it was gone by 8:00 p.m., which broke my heart because I really love bacon. Two women I met while at the Suntory table told me that their favorites – outside of the whisky, of course – were the pressed sushi from Takahachi and Red Rooster Harlem’s dessert. It may sound strange that a fundraiser for a Japanese-centric organization would include dessert from Red Rooster Harlem. 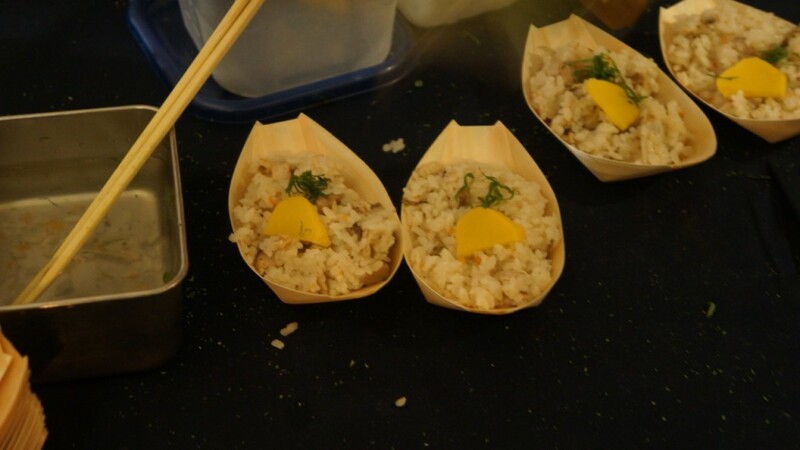 This year’s theme was a celebration of Japanese ingredients, though not necessarily used in traditional Japanese dishes. That’s primarily why non-Japanese restaurants such as Gramercy Tavern, Oceana, Red Rooster Harlem, and Talde participated. 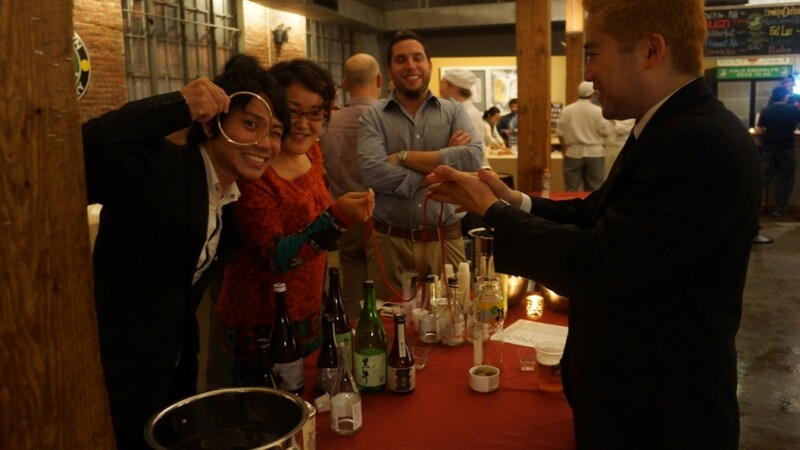 In fact, The Gohan Society has been advocating that sake and other Japanese beverages shouldn’t be paired with only Japanese food, as it demonstrated with a tasting/fundraiser at Red Rooster Harlem in March of this year. 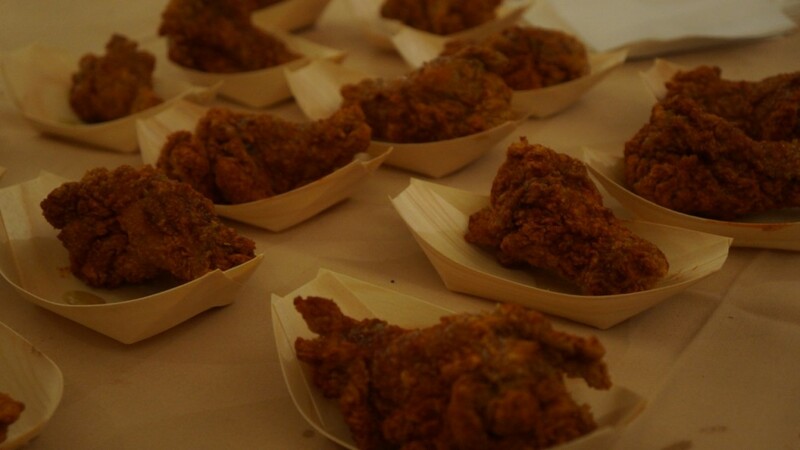 So instead of serving sushi, Blue Ribbon Brooklyn cooked up some fried chicken wings with wasabi honey. Finger-lickin’ good. Morimoto also served fried chicken wings with a fiery hot sauce as well as pork kakuni with the most delicate daikon I’ve ever eaten. 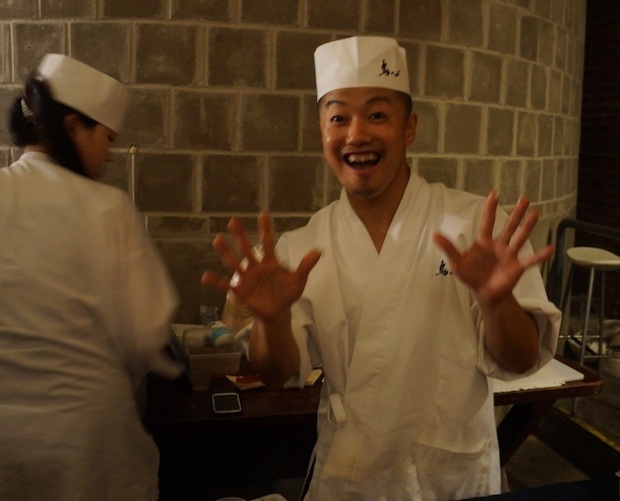 Michelin star-winning yakitori specialist Tori Shin had to be creative and developed a dish especially for the occasion. “I can’t do yakitori here [at Brooklyn Brewery] because of no ventilation,” says Tori Shin Chef Atsushi Kono, “so I had to make something else and decided on Kashiwa Gohan. It’s rice with chicken and vegetables.” Scrumptious. Of course, I suppose it’s hard to have an event like this and not have sushi. 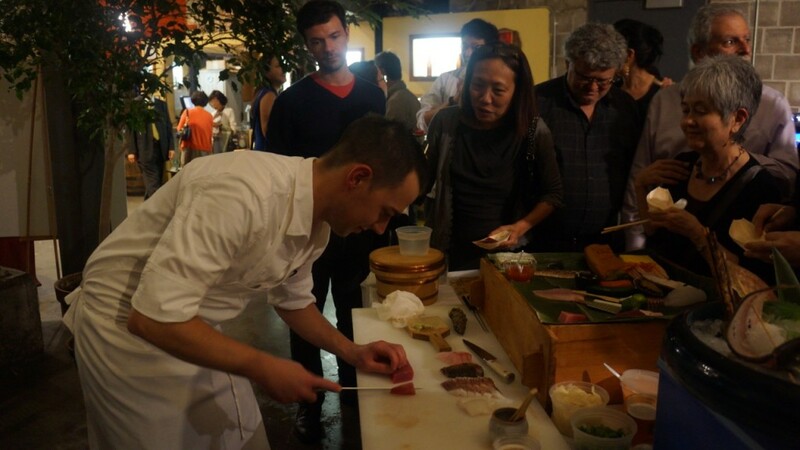 In addition to Takahachi’s pressed sushi, guests clamored for the nigiri from Sushi Zen. 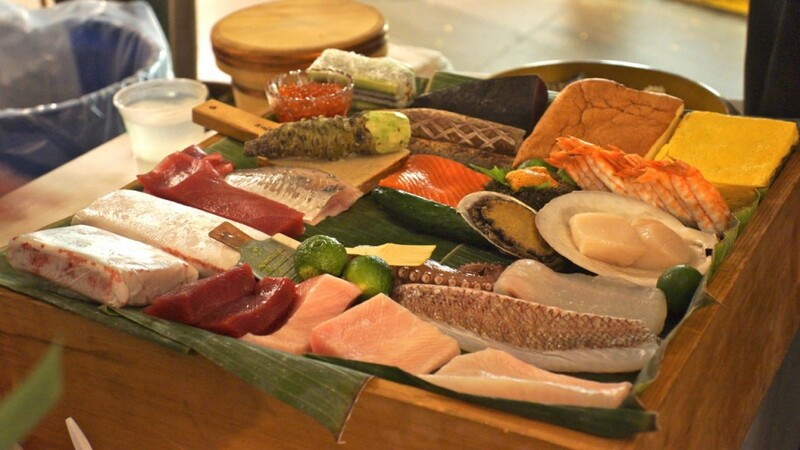 Chef Masaharu Morimoto’s sushi demonstration turned into a fireside chat while his head sushi chef, Robby Cook, did all of the slicing of sumptuous blocks of fish. 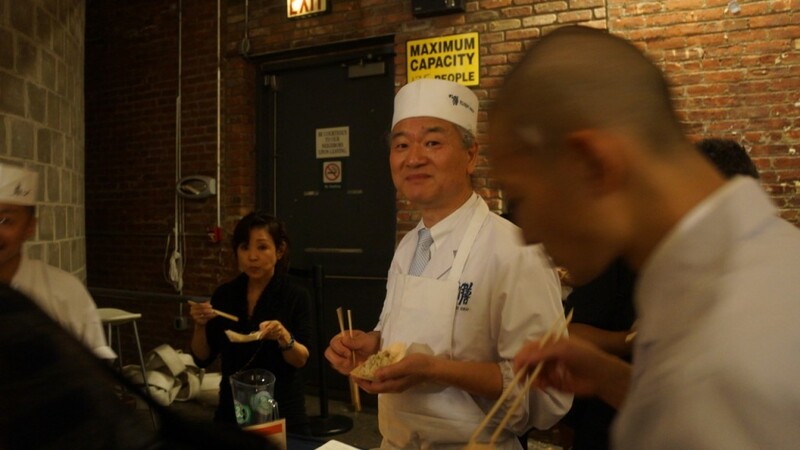 Then Chef Morimoto narrated as Chef Shuichi Kotani of Soba Totto made a batch of soba noodles. Soba Totto’s green tea soba with matsutake seemed light and summery despite its autumn ingredients, but it was delicious nonetheless. I suppose the real lesson from Aki Matsuri 2012 is that Japanese ingredients make any kind of cuisine come to life, especially when you have good beverages, a good crowd, and a good cause to accompany them.